"When he’s working on a case, no stone goes unturned. Truly a tenacious, detail-oriented advocate for his clients." 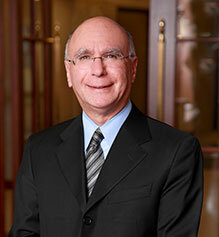 Mitchell Shore is a partner at Kolsby Gordon, where he concentrates his practice on representing individuals and their families in complex medical malpractice cases, including those involving anesthesia complications, obstetric and gynecologic complications, surgical complications, delay in diagnosis of cancer, and inappropriate pharmacy practices. Mr. Shore has also represented families involved in tractor-trailer, auto and aviation accidents in claims against airplane manufacturers and manufacturers of aviation parts and engines. A dedicated attorney known for balancing tenacity with a deep respect for both his clients and the law, Mr. Shore approaches each of his cases with unsurpassed thoroughness and efficiency. Mr. Shore has litigated many of Kolsby Gordon’s most significant cases, some of which have had wide-reaching effects on their respective industries. In a case with significant safety implications, Mr. Shore represented the family of a ten year-old boy who lost both arms after receiving a substantial shock from a Philadelphia electric sub-station. The boy chased a rabbit into the station, unaware of the extreme danger. He came into direct contact with the top of a capacitor—an exceedingly dangerous piece of equipment that converts high voltage electricity to the voltage used in residences and businesses. At the time of the incident, roughly half of Philadelphia’s capacitors were not covered, which posed serious safety hazards to the surrounding community. As a result of this successful case, all capacitors in Philadelphia are now covered by a chain-link fence, and new safety signs with more graphic descriptions of hazards have been erected. Mr. Shore has also represented victims of medical malpractice. In a case of hospital negligence, Mr. Shore helped the family of a young man diagnosed with acute lymphocytic leukemia who, after receiving a stem cell transplant, went back for additional treatment years later. In an error that cost this man his life, the hospital had thrown out the stem cells taken from his first stem cell removal after mistaking them for a patient with the same name, despite having differing social security numbers and birthdays. Mr. Shore and the team of attorneys at Kolsby Gordon helped this family settle for a significant sum from this major Pennsylvania health care institution. Mr. Shore started at Kolsby Gordon as a messenger while a senior in high school in 1973, and has practiced law with the firm since graduating from law school in 1981. Throughout his career, Mr. Shore has been involved with various medical malpractice cases, including complex tort claims against pharmaceutical manufacturers in national drug litigation concerning Diethylstilbestrol (DES), Selacryn, Baycol, PPA, and Phen Fen. He has also represented those hurt by drug product devices including the Dalkon Shield, gastric bubbles, and bronchoscopes. In a number of cases, he has worked as local counsel with law firms from across the country, coordinating and litigating the claims of many hundreds of people. Mr. Shore is active in a number of community organizations, including serving on the board of his synagogue and local lifecare communities. He also spent a number of years serving as the chairman of the Jewish Federation of Philadelphia’s Young Leadership Council, and working for its national partner, United Jewish Appeal. For his efforts, the Federation awarded Mr. Shore the Myer and Rosaline Feinstein Young Leadership Award, which recognizes outstanding contributions to the Jewish community. Mr. Shore also sat on the executive committee and served as chair of Presidential Classroom for Young Americans for a number of years, a Washington D.C.-based nonprofit which brought high school students across the nation to Washington for a one-week in-depth look at our capitol. Over 4,000 students participated each year in the program, which fostered civic engagement and community involvement.